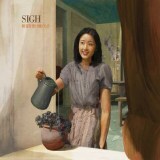 Sigh are always an interesting band to listen to, yet not always a band that succeeds in their ambitions. The mix of underground metal and avant-garde influences are never equal and often more interesting when the latter takes the lead, resulting in albums like 2012's excellent In Somniphobia. Although the others are very rarely bad, they can seem lesser in comparison, making the likes of 2015's Graveward come off as disappointing as a result. And although it would be far too harsh to classify Heir to Despair with the latter album rather than the former, it does suffer from a lack of focus at times, the experiments being just a little too scattershot to work as well as they should. Which is a shame as the solid metal core of the album is solid, as is Sigh's songwriting, and the album gets off to a tremendous start thanks to the band's usual mixture of black metal, jazz, folk, and prog being particularly to the fore on melodic opener Aletheia. It has something of an exotic, near-Middle-Eastern feel thanks to the shamisen (a kind of Japanese banjo) and flute, not to mention some downright insane alternating Japanese singing, growling, and vocoder vocals helping to increase the oddness. Despite that, it's still as catchy as more straightforward tracks elsewhere, even with the ending descent into electronic hell. Trust Sigh, then, to follow this with Homo Homini Lupus, the first of several (relatively) straightforward heavy metal pieces, this one with Phil Anselmo guest-growling. It's absolutely stuffed with memorable riffs and melodies (courtesy of Kadenzza's You Oshima, now a stable part of the lineup after joining for Graveward) having a latent thrashiness that only raises its head intermittently, filling the surrounding space mostly with lead guitar and lashings of keyboards. The songs following are of a similar style, Hunters Not Horned with the best incorporation of the flute on the album, a near-constant companion to the quirkily rocking prog-thrash riffing, and In Memories Delusional upping the tempo and thrashiness considerably but also throwing in more shamisen and orchestral flourishes to keep things fresh. So far, so good, then, yet things take a turn for the worse with the Heresy tryptych, easily the weakest part of the album. Heresy I: Oblivium is a sudden trip-hop nightmare soundscape with electronic beats and effects behind Mirai's sinister snarls, like a Japanese version of mid-period Manes with added flute solos and occasional Slayer riffs. Heresy II: Acosmium is practically an interlude at just under two minutes length, dominated by processed vocals and an outro burst of Mr Bungle-esque madness, before Heresy III: Sub Species Aetenitatis heralds something of a return to the trip-hop, albeit with more focus on vocals than Heresy I and more Bungle-isms at the end. As a whole, the three are very skippable even for those willing to accept Sigh's non-metallic experiments, and the change in tone and style compared to the more metallic songs is drastic enough for it to be jarring. Fortunately we still get the solid experimental thrash of Hands of the String Puller (which throws everything in from late-Atheist funk to duelling flute/guitar solos) and the closing ten-minute title track which is a late highlight, building up unsteadily like some 70s prog rock epic with hand percussion and meandering lead melodies which somehow still manage to feel a relevant part of the song. The vocals approach beautiful at moments, a tribute to Mirai and his muse/saxophone-toting nightmare banshee/fiancée Dr Mikannibal, but as a whole the effect is never less than unsettling, even if the distorted child voices at the end are a bit over the top. Both the mix (courtesy of Maor Appelbaum, clear yet not glossy) and the instrumentation are excellent, the former not always a given with Sigh if the latter usually is, and as a whole the album is very relistenable, songs lodging in your head but rewarding repeated listens with their complexity. Perhaps more time spent with this would have seen it creep on to my end-of-year list for 2018, but even taking the Heresy suite into account it's still an excellent album and a big improvement on Gravewards that shouldn't be missed.